Liberals have nothing but hate in their souls… if they have souls, that is. This story is yet one more example of this truism. 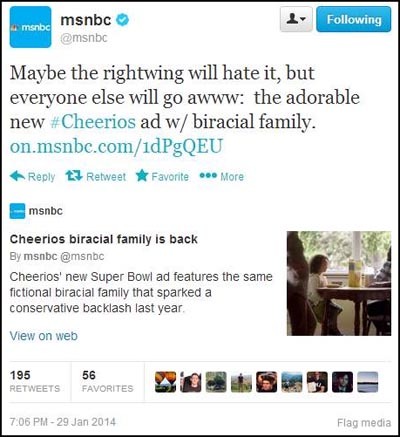 Take for proof a Tweet on the official MSNBC Twitter account that claimed that conservatives will hate the new Cheerios Super Bowl ad because it features a bi-racial family. Yeah, Riiiight. Sure it doesn’t. Sorry, MSNBC but your apology is not accepted. Oh, we’re sure you are sorry because even some of your fans thought your hate was way over the top. We’re sure you’re sorry you got caught revealing what you really think. But the simple fact of the matter is, this isn’t just “a” Tweet. It is the revelation of the inner feelings of every single employee of MSNBC. Further, it is indicative of the black heart sitting dead still and un-beating in the chests of every last denizen of the Old Media establishment. MSNBC did not just toss off a bad joke. It revealed the hate infesting its soul. Remember, this is the same network that made days of coverage out of ridiculing Mitt Romney because one of his children adopted an African American baby. Now, imagine if Fox News or a website like HotAir or The Daily Caller, Glenn Beck, or any of the many conservative think tanks and activist groups had put out a Tweet this hateful. 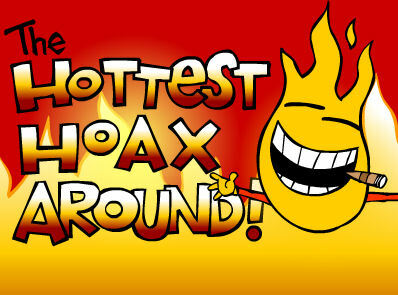 It would be the subject of a firestorm of media coverage that would destroy institutions, ruin lives, and end careers. But that MSNBC did it, well, the media will ignore the story. But it will be ignored, regardless. Why? Because every last employee in the Old Media establishment agrees with the hate in the original Tweet. 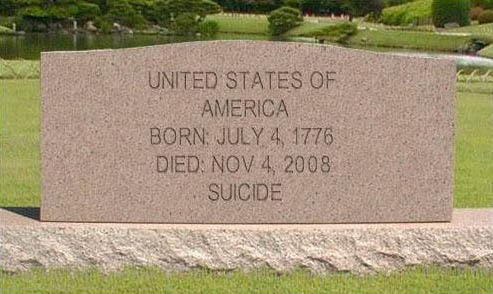 They hate you with the last breath, America. This Tweet is just another example.